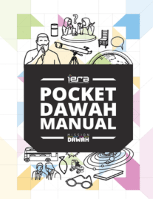 This booklet serves as a beginner’s toolkit to understanding the importance of dawah and also how to give dawah. By the end of this booklet, you will have mastered a framework on how to convey the message of Islam effectively. This framework is like a skeleton which requires you to do further advanced studies in order to add meat to it.